(Francisco Kjolseth | The Salt Lake Tribune) A pumpkin patch is set up for students at Jordan Valley School in Midvale, Canyon District's school for students with severe disabilities, allowing them an opportunity to pick out their own pumpkin, an opportunity they look forward to on Wed. Oct. 24, 2018. Inmates who take part in the Green Thumb Nursery program at the Utah State prison grew and harvested the pumpkins that were donated to the school for the 10th year. (Francisco Kjolseth | The Salt Lake Tribune) Monet Heath, 15, embraces her pumpkin as students at Jordan Valley School in Midvale, Canyon District's school for students with severe disabilities, get a chance to pick out a pumpkin from their very own patch set up in front of the school on Wed. Oct. 24, 2018. Inmates who take part in the Green Thumb Nursery program at the Utah State prison grew and harvested the pumpkins that were donated to the school for the 10th year. (Francisco Kjolseth | The Salt Lake Tribune) Tanner Farnsworth, 18, with Latinos in Action at Jordan High School and Dan Blanchard with the Department of Corrections help a young student at Jordan Valley School in Midvale, Canyon District's school for students with severe disabilities, pick out a pumpkin from a pumpkin patch set up in front of the school on Wed. Oct. 24, 2018. Inmates who take part in the Green Thumb Nursery program at the Utah State prison grew and harvested the pumpkins that were donated to the school for the 10th year. (Francisco Kjolseth | The Salt Lake Tribune) Ethan Woodley, 6, tastes his choice as students at Jordan Valley School in Midvale, Canyon District's school for students with severe disabilities, get a chance to pick out a pumpkin from their very own pumpkin patch set up in front of the school on Wed. Oct. 24, 2018. Inmates who take part in the Green Thumb Nursery program at the Utah State prison grew and harvested the pumpkins that were donated to the school for the 10th year. (Francisco Kjolseth | The Salt Lake Tribune) Noah Wright, 9, gets a little help picking out a pumpkin from Jim Hudspeth, with the department of corrections as students at Jordan Valley School in Midvale, Canyon District's school for students with severe disabilities, get a chance to pick out a pumpkin from their very own pumpkin patch set up in front of the school on Wed. Oct. 24, 2018. Inmates who take part in the Green Thumb Nursery program at the Utah State prison grew and harvested the pumpkins that were donated to the school for the 10th year. 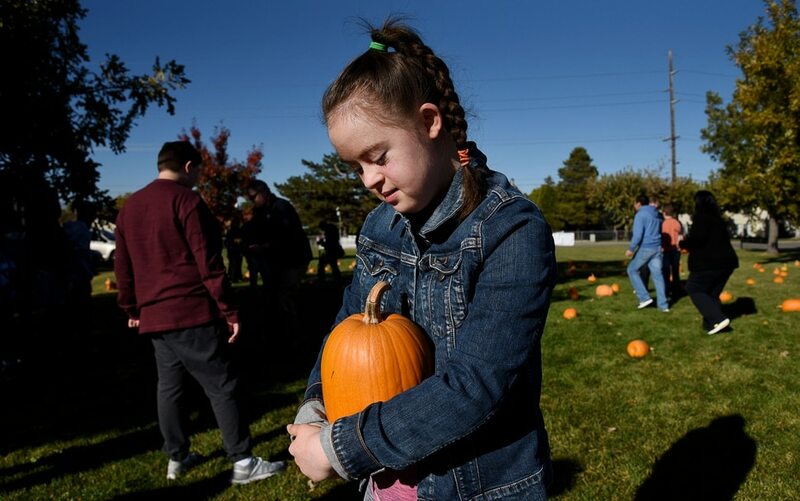 (Francisco Kjolseth | The Salt Lake Tribune) Emma Robinson, 7, makes her choice as students at Jordan Valley School in Midvale, Canyon District's school for students with severe disabilities, get a chance to pick out a pumpkin from their very own pumpkin patch set up in front of the school on Wed. Oct. 24, 2018. Inmates who take part in the Green Thumb Nursery program at the Utah State prison grew and harvested the pumpkins that were donated to the school for the 10th year. (Francisco Kjolseth | The Salt Lake Tribune) A pumpkin patch is set up for students at Jordan Valley School in Midvale, Canyon District's school for students with severe disabilities, allowing them an opportunity to pick out their own pumpkin, an opportunity they look forward to on Wed. Oct. 24, 2018. Inmates who take part in the Green Thumb Nursery program at the Utah State prison grew and harvested the pumpkins that were donated to the school for the 10th year. (Francisco Kjolseth | The Salt Lake Tribune) A pumpkin patch is set up for students at Jordan Valley School in Midvale, Canyon District's school for students with severe disabilities, allowing them an opportunity to pick out their own pumpkin, an opportunity they look forward to on Wed. Oct. 24, 2018. Inmates who take part in the Green Thumb Nursery program at the Utah State prison grew and harvested the pumpkins that were donated to the school for the 10th year. (Francisco Kjolseth | The Salt Lake Tribune) A pumpkin patch is set up for students at Jordan Valley School in Midvale, Canyon District's school for students with severe disabilities, allowing them an opportunity to pick out their own pumpkin, an opportunity they look forward to on Wed. Oct. 24, 2018. Inmates who take part in the Green Thumb Nursery program at the Utah State prison grew and harvested the pumpkins that were donated to the school for the 10th year. 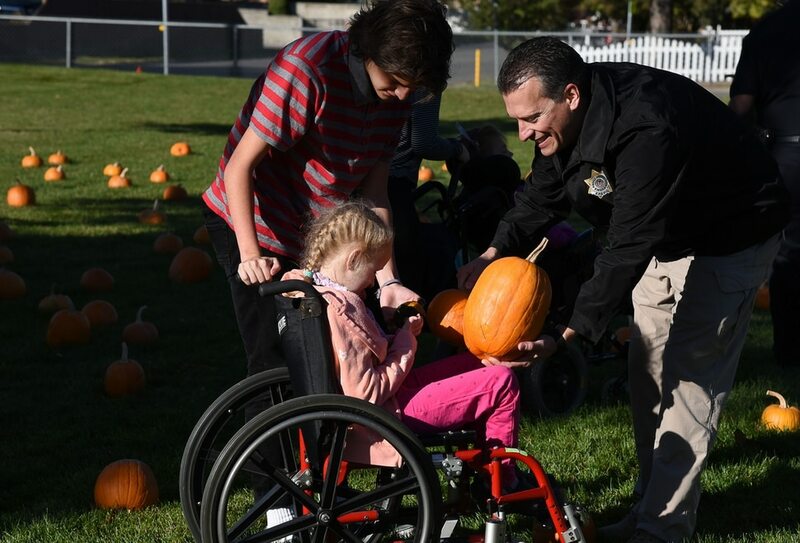 For the 10th year in a row kids at Jordan Valley School, Canyon District’s school for students with severe disabilities in Midvale, got a special Halloween treat. 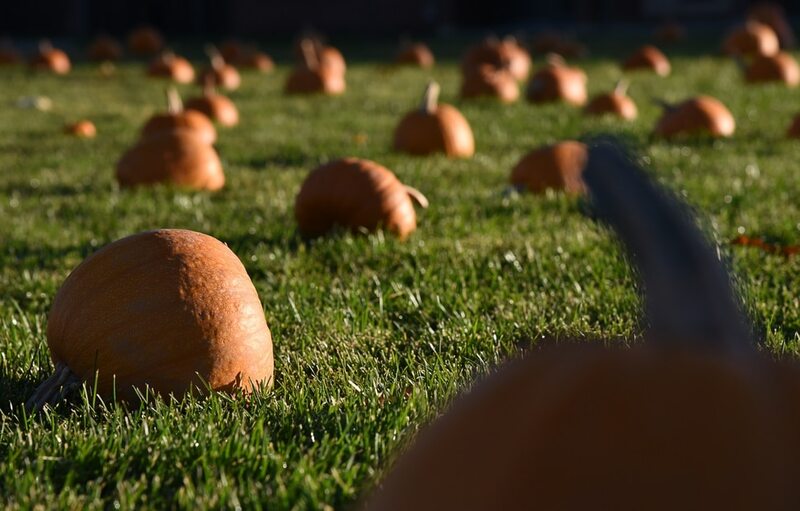 Utah State Prison inmates working through the prison’s Green Thumb Nursery program grew and donated the crop of around 200 pumpkins to the school on Wednesday. School and prison corrections staff set up the pumpkin patch on the school’s front lawn, giving kids an opportunity to socialize with their classmates and a chance express some independence, as they made their selections for Halloween.